This is a condensed version of this interview. Click here for the full version, which is available to members or on a pay-per-view basis. Debbie McDonald is a former Hunter/Jumper rider who switched to Dressage in 1990. In 1999 Debbie and Brentina took first place in the State Line Tack/USET Inter. 1 Championships at the Festival of Champions in Gladstone N.J. That earned them a spot on the Pan American Team in Canada. They went on to win the Team and Individual Gold Medals. 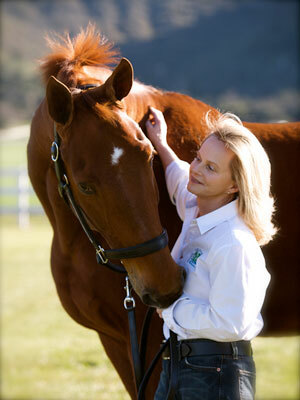 Debbie was voted the USOC Woman of the year, AHSA Equestrian of the year. Brentina was also named the AHSA horse of the year. In 2001 Debbie and Brentina won the GP Championships at the Festival of Championships. In 2002 they once again won the GP Championships at the selection for the WEG in Spain. They went on to win a team silver medal, best and finished 4th overall. In 2003 they were given a Wild Card to the WC in Sweden. As it would turn out they won the WC title. They are the first Americans to hold such a title they also were members of the team that went to Aachen, were they were once again team Silver and Bronze individual. The were also 2003 USOC Athlete of the Year. In 2004 They won the Freestyle Championships. They went to Germany and showed in Dortmund where they won the GP and the GPS. They were given a spot on the Olympic Team for Athens where they led the team to a Bronze Medal, and finished 4th Individually. In 2005 They won the Freestyle Championships. They went on to the WC in Las Vegas where they finished third. In 2006 They were a member of the team that went to the WEG in Aachen, Germany were the helped bring the US a Bronze Medal home. In 2007 Brentina did not show healing from an injury. In 2008 Brentina once again represented the US on the Olympic Team in Hong Kong. In 2009 Debbie Was named the USEF Developing Coach of the Year. Debbie is also featured in the Get Connected USEF Tests 1-19 video we offer for sale on our site. Click here to watch a preview and purchase. Sit down with Dressage super star Debbie McDonald and her top hunter/jumper trainer husband Bob, as they reminisce about their life together. A life together that’s been built on their mutual passion for horses and one horse in particular, Brentina. This video features Debbie and Brentina’s legendary free-style at the 2005 World Cup in Las Vegas. Sit down with Dressage super star Debbie McDonald and her top hunter/jumper trainer husband Bob, as they reminisce about their life together. A life together that’s been built on their mutual passion for horses and one horse in particular, Brentina. The movements in Second Level are designed to show that the horse accepts more weight on the hindquarters, moves with an uphill carriage and remains steadily on the bit. In this topic, Debbie McDonald and her student, 2012 London Olympian Adrienne Lyle, take a special young horse (Brentina’s half-sister) through exercises appropriate for a horse at this level and practice riding parts of a Second Level Test. The movements in Third Level are designed to show greater engagement, straightness, bending, suppleness, throughness, balance and self-carriage than at Second Level. In this topic, Debbie McDonald and her student take a young Andalusian through exercises appropriate for a horse at this level and practice riding a Third Level Test. The movements in Training Level are designed to show that the horse is supple, willing to move freely forward while accepting contact with the bit. This is often the starting point of a horse’s Dressage career. In this topic, Debbie McDonald and her student, 2012 London Olympian Adrienne Lyle, take a young horse through exercises appropriate for a horse at this level and practice riding parts of a Training Level Test.